Does shopping at the grocery store overwhelm you? Do you have difficulty understanding nutrition labels and making your budget stretch to provide healthy meals for your family? Then Shop Smart grocery tours are for you! 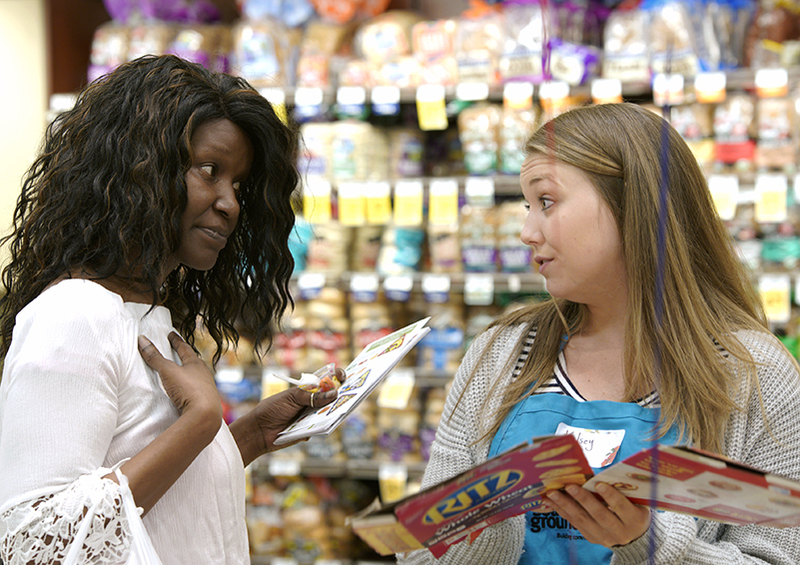 The most recent Shop Smart took place June 2 at the Safeway Rainier Beach. Over 30 people sampled healthy foods from the five food groups as defined by MyPlate (fruits, vegetables, grains, protein and dairy) with delicious snacks like mango salsa, roasted curried chickpeas, pesto pasta salad, and strawberry banana smoothies (see slideshow below). Once participants visited with costume-clad volunteers at each food group station, they finish the tour with a reusable grocery bag and a $10 Safeway gift card to practice the skills they just learned. 75% of our participants said they were thinking about trying a new way to shop for food that they learned about on the tour within the next six months, or even on their next shopping trip! The grain station was especially popular. As one participant said, “Not all things that say they are whole grain [on the front of the package] actually are.” People also talked about learning shopping tips to save money, such as looking for sales, buying frozen or canned produce, and using unit prices to find the best deals. The next Shop Smart event is August 4. Keep an eye on Solid Ground’s Events webpage for more info later this summer, or contact Sandra Largaespada, Bilingual Partnerships Coordinator. There is another way to get produce: grow it! Most people can grow some herbs, strawberries or tomatoes in pots, even without garden space. Edible herb plants and seeds can be purchased with EBT. I ate fresh basil and strawberries yesterday, from pots, and I live in the shadow of a large building. Green onions will root and grow in a glass of water, even in winter! Eating a fresh living bite every day provides essential enzymes to the gut flora, so it’s not just a ‘pleasure’.